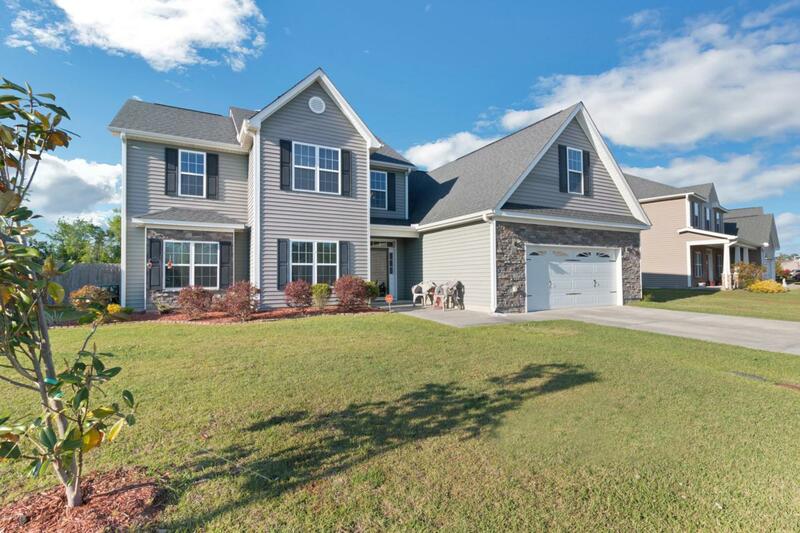 Come see this gorgeous 5 bedroom and 3.5 bathroom home centrally located in Jacksonville, NC! Upon entering, you will be greeted by its grand 2 story foyer, porcelain tiles on the entire first floor with an open layout designed with entertaining in mind - featuring a lovely dining room, modern stainless steel appliances in the kitchen with a pantry, a large island, plus a breakfast nook, and a roomy living area which includes a fireplace. The master suite resides downstairs comprising of a spacious walk-in closet off the bathroom, a separate linen closet, deep-soaking tub, and separate shower. Upstairs you will find the 4 other bedrooms, plus a spacious bonus room with closet space which can be converted into a home office, den, and so much more!This home is full of storage space, situated in the beautiful Carolina Plantations subdivision with NO CITY TAXES, it takes a spot in the heart of Jacksonville, NC, making it conveniently just minutes away from all military bases, shopping centers, restaurants and more! Call now and schedule your showing today!! Listing provided courtesy of Sharon C Lopezramirez of Re/Max Elite Realty Group.